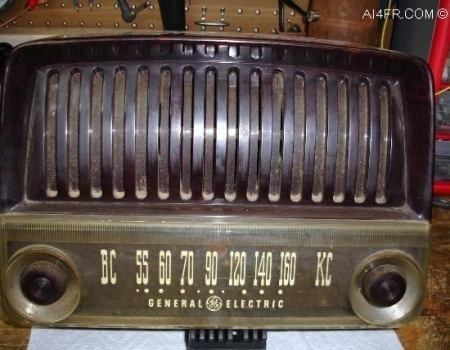 The General Electric model 135 is a super-heterodyne receiver design that covers the AM Broadcast band of between 540 to 1600 Kc. 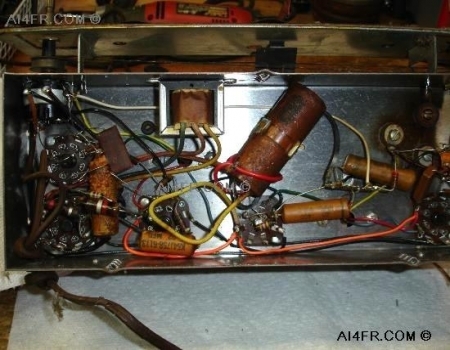 The radio makes use of the following 5 tubes in its circuit: 35Z5GT/G, 50L5GT, 12BA6, 12SA7, 12SQ7. 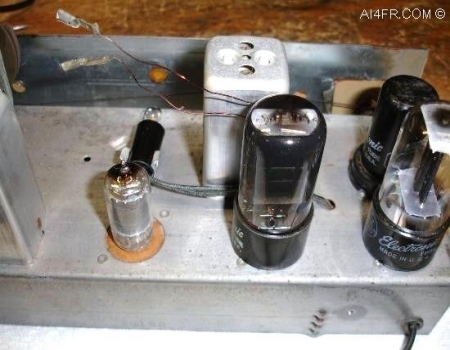 The IF(Intermediate Frequency) on this receiver is 455kHz and the circuit incorporates two AF(Audio Frequency) stages. This radio has a built in PM(Permanent Magnet) speaker. The antenna is a loop which is glued to the inside of the back cover. 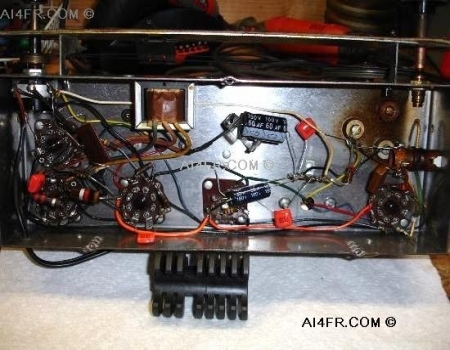 This radio requires either AC(50 or 60 cycles) or DC at between 105 to 125 volts and draws 25 watts. 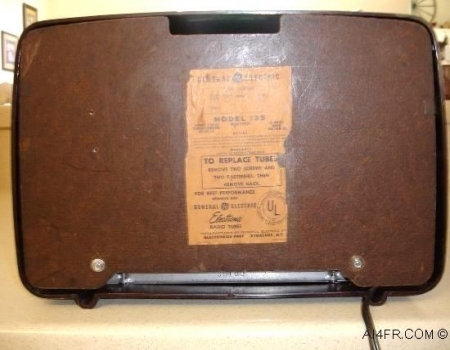 The model 135 is housed in a brown plastic case. 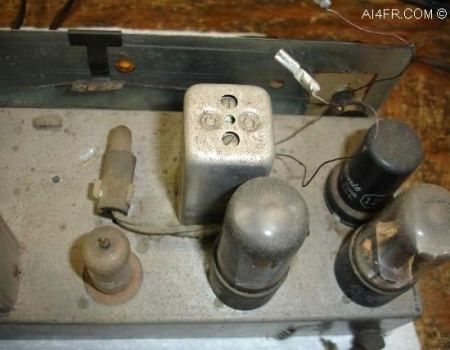 Operation of the radio is quite simple consisting of two user control knobs. The knob on the bottom left corner is used for on/off and volume control. 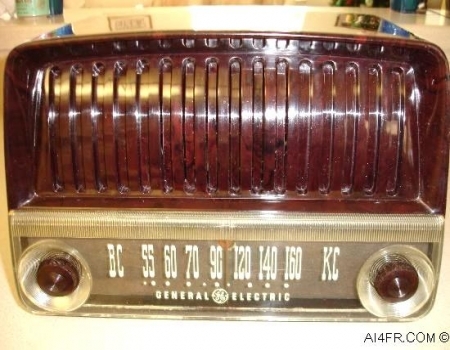 Rotating this knob to the right turns on the radio and increases the volume.The knob on the bottom right corner is used to change the receive frequeny of the receiver. The operator simply turns this dial to the left or right to receive stations. A reddish orange tuning indicator located behind the display of numbers allows the operator to know where on the broadcast band the radio is tuned. While the radio can receive from 540 kHz to 1600 kHz the numbers marked on the display start at 55 which indicates 550 kHz and go to 160 which indicates 1600 kHz. The two pictures above were taken after the restoration was complete. 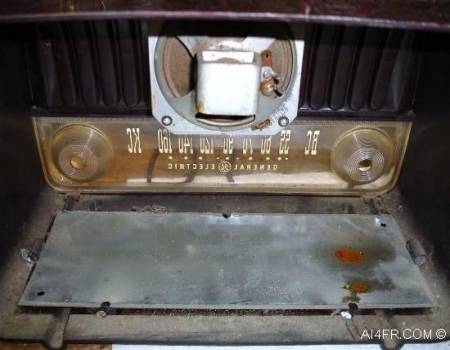 The photograph on the left is of the front showing what the radio looked like before restoration. The photograph on the right is of the inside with the guts removed at the beginning of the restoration process. In the picture on the right we can also see the PM speaker and on the bottom of the cabinet notice the metal RF shielding plate. The photograph on the left is a picture of the top of the chassis before any cleaning or restoration was attempted. While the photograph on the right is a picture of the beginning stages of the restoration process. The photograph on the left is proof positive that them Florida roaches can get into any thing. The roach that left the egg behind the dial marker must have really liked the radio station this receiver was turned to. The photograph on the right is a close up of one of the components found under the chassis. 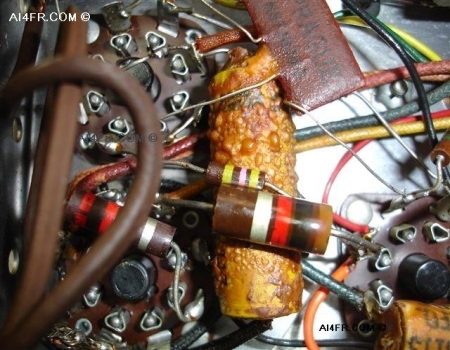 Wow, what happened to that capacitor in the center of the picture? I wonder if all them blisters are a form of capacitor chicken pox? 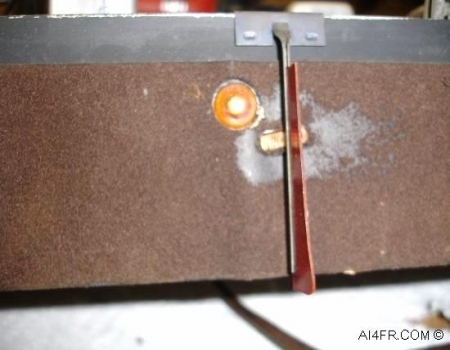 Or maybe this capacitor did not like the radio station as much as the roach did. The photograph on the left is a view of under the chassis taken during the restoration process. Surprisingly, under the chassis of this receiver was rather clean. So besides some dusting and cleaning of the wires and and components no major work was needed here. The picture on the right is an after restoration photograph showing many of the new parts installed.